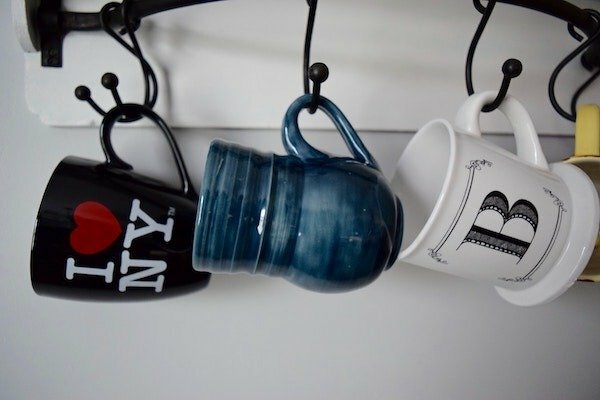 Cups on hooks, do they belong there? What happens when you find yourself in a shared housing situation and you discover that your home-mate does things differently. Do you bring it up so often that it becomes an issue? Do you say nothing and let it fester inside you? Or do you remark about it in a passive-aggressive manner that you hope your home-mate is looking for another home-sharing environment? Before you decide it’s time to share your home (or another person’s home), sit down and do a little self-examination. Ask yourself what you definitely need to have in your home that you don’t want changed by someone else’s habits. For example, I have two dogs who bolt for the door whenever they see an open one. I don’t give them free range of the house unless they are supervised. For their safety, they’re allowed to be alone in two rooms–my home office and my bedroom. If I allow them in the living room, I need to make sure the kitchen door and front door are always shut. An open door that can lead outside to the street can become an instant tragedy. Leaving the door open as you fetch groceries from the car or go out to get the mail and the dogs are freely roaming around the house is a definite no-no. Be honest with yourself about what those things are for you. The danger here is that you fall into a trap of being so full of rules that no one else will want to live with you. Write down what you believe to be are actions that are simply non-negotiable. These can include leaving lights on, doing laundry daily, not rinsing the dishes before they go into the dishwasher, and so on. For the most part, if it concerns a safety issue, your future home-mate will understand. Communication is so important. If you find yourself face palming every time your home-mate puts a something away where it doesn’t belong (and you’ve spent several minutes searching for it) don’t stew about it. Speak up. It could be that your home-mate has an idea about where it belongs based on her past experience. Asking, “How come you always put it there?” as a genuine question can open up the conversation. Maybe you’ll like her rationale or maybe she’ll learn that it really does matter to you that it goes where it goes. Or as you talk you’ll make an entirely different plan. Who knows. You do have to speak up. It’s always easiest to do it as soon as you feel the little twitch of “huh”? Consider that what your home-mate does differently might make better sense. She might have a better sense of space and use it more efficiently. Be open to change and learn from each other. Do you have any experience of this? If so, how did you manage to iron out a situation with your home-mate who does things differently than you do?